We as a reliable manufacturer, exporter and supplier of Indian domestic market, hold expertise in offering a unique assortment of superior quality water pressure boosting system, and automatic pressure boosting system for our valued clients. 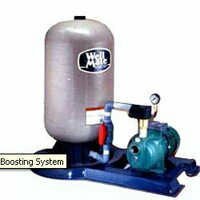 Our designed and manufactured water pressure boosting system are easy to install, operate and do not require lot of maintenance. These systems are good to go for domestic and industrial use for uninterrupted supply of high water flow and high pressure and also assists in boosting the low water pressure automatically at homes or industry. We provide these pressure boosting system to clients at industry leading prices.